People have a lot to say about the Cronut™ pastry. 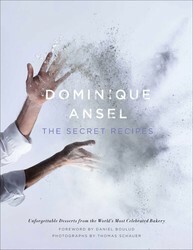 But they always start off with the same question: “How did you do it?” And this is quickly followed by: “How can I do it, too?” Find out, from Dominique Ansel: The Secret Recipes. For months, I explained to journalist after journalist that there was no magic formula or marketing strategy behind this croissant-doughnut hybrid. It was simply another creation. I was making a snack for the team who said they wanted to eat doughnuts. Having no recipe for a doughnut, I decided to make my own. Glazed on the top, the pastry was filled with cream and sugared like a doughnut, but it had a laminated dough that was similar to—but not the same as—croissant dough. Crispy on the outside, with tender layers within, it was a playful treat. 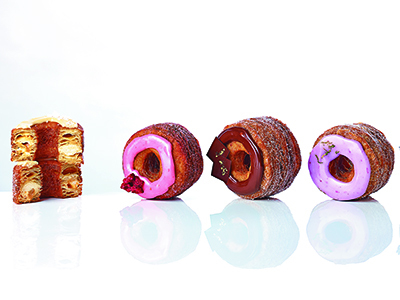 Two months and ten recipes later, the Cronut pastry was born. Nobody could’ve imagined what would happen next. Picasso sketched and painted his whole life, yet only a fraction of his actual body of work became recognizable. Mozart composed since he was a child, but many of us can hum only a few notes from his symphonies. What’s more, they both started off not knowing how to paint or play music at all. And it took every bad sketch and amateur composition to mold them into someone the world applauded. Creativity is about living through every creation, even the lackluster ones. The best creations have makers who are fully immersed in living a creative life. They are all a step forward. I had always believed in that, but inventing the Cronut pastry taught me how to not fall two steps back. One May morning in 2013, just three days after we launched the Cronut pastry, more than a hundred people were waiting outside the door. The line started three hours before our 8:00 a.m. opening time, and we were just four people inside: two baristas in front and two cooks in the kitchen. “We’re going to do great,” I assured one of the girls working behind the register, trying to swallow the panic bubbling inside me. She had started to tremble at the thought of the crowd bursting through the doors of our small shop in the next few minutes. Within the cocoon of the bakery walls, we had only heard murmurs of how our humble dessert had “gone viral” and “was trending.” Each story was wilder than the next, from a person who sold a secondhand Cronut pastry for $100 on the black market, to customers offering bribes to our employees, to the sad moments when we caught people going through our trash for whatever rejected portions of the pastry we had tossed out earlier that morning. We were too caught up in trying to do what we could to either gasp in disbelief or rejoice in the success. All we could focus on was getting through the tornado of daily events. No matter how steep the climb ahead, the trip is always made easier when you know where you’re going. And I had seen my destination in one word: creativity. We moved on. We did the one thing nobody thought we would do—we tried to ignore the Cronut pastry. We handled matters as we did any other day. Prices were not raised. Large corporations didn’t consume us. And growth, although a natural progression in any business, was dealt with mindfully and without rush. Together as a team, we no longer feared the line. We embraced those who waited patiently, with hot chocolate and hand warmers during the winter months and fresh-baked madeleines in the summer. They were serenaded by carolers during the Christmas season and gifted long-stemmed roses on Valentine’s Day. We capped our production—not in an effort to make things “exclusive” but rather as a way to preserve the quality of the product. At one point we had not only moved on, but moved beyond. We saw that the Cronut pastry had become a symbol of creativity that drew crowds from around the world, which in turn inspired me to keep working toward my destination and move on to the next creation. Few things are defined by the moment they were born, but rather the story they lived through. The real secrets lie not in the recipe of the Cronut pastry, but in the infinity that lies ahead of it. How do you catch lightning in a measuring cup?Dominique Ansel is the creator of the Cronut™, the croissant-doughnut hybrid that has taken the world by storm. But he’s no one-hit wonder. Classically trained in Paris, responsible for a four-star kitchen in New York, and now the proprietor of New York’s highest rated bakery, Ansel has become a modern-day Willy Wonka: the creator of wildly creative, extraordinarily delicious, and unbelievably popular desserts.